Fu and company are having a meal at the cafe when Kou shows up, causing Norie to go bonkers. Later, when Norie and Maon are shopping, they notice someone is following them, and finally discover it’s a girl named Komachi. Komachi tells them that she’s doing surveillance on Norie because of her behavior around Kou, who is also Komachi’s classmate. They then get into a baking contest at the cafe to see who can make the best sweets, with Kou being the judge. Of course, they end up in a tie with Kou loving both of their sweets. I another good episode, I thought. This time we’re introduced to Komachi, a classmate of Kou’s who also has a crush on him. Obviously the tension between Komachi and Norie is going to be some added comedic relief to this show, and so far it’s doing pretty good. It was kinda cute how Komachi worked to make her hotcakes for Kou, even though she didn’t really know how to do it, but it turned out OK in the end. I also had to kinda of lauch at the fact that Norie may have finally found someone more hyper and crazier than herself. Some shows are what I might call “hyper” slice-of-life shows: shows that fall into the slice of life category, but are really fast paced. 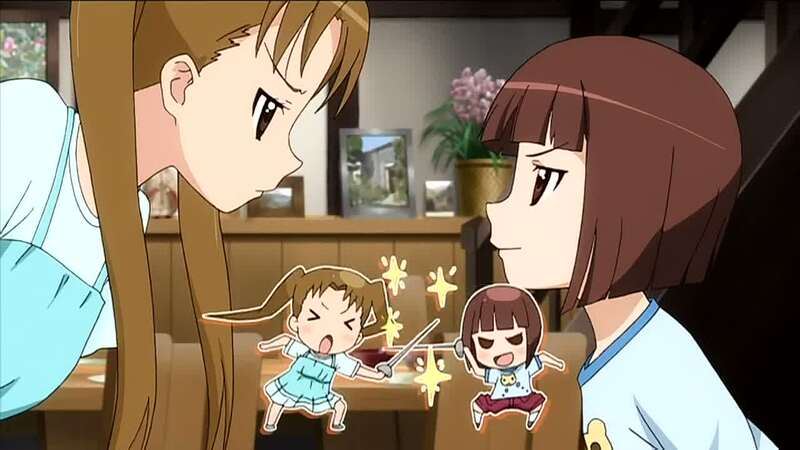 Examples of shows like that include Azumanga Diaoh and Lucky Star. Then you have a show like this, which is also slice of life, but the pace is really slow. Probably the closest shows I can think of might be Sketchbook and Hidimari Sketch, with both happening to be artsy shows as well. If anything, I like this show better than either of those, at least so far. 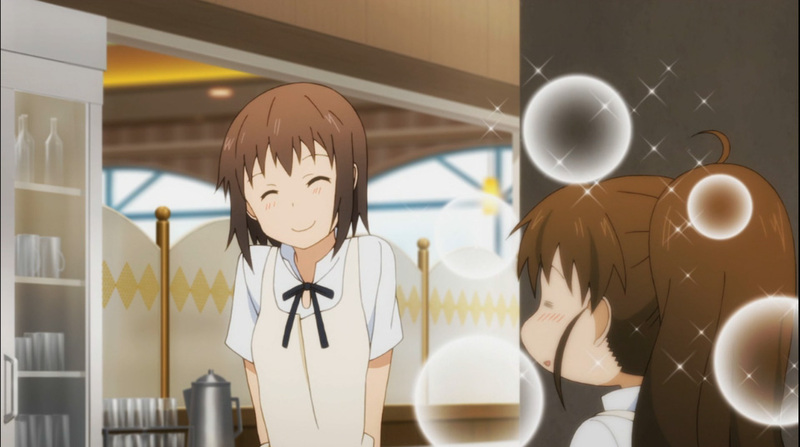 Souta’s little sister Nazuna is working at the restaurant. This leads to a discussion with Izumi the next morning where Nazuna ends up falsly believing that Souta is dating Poplar (and that she’s in elementary school). Distraught, Izumi goes off on a “journey” where she runs into Mahiru. Mahiru tries to cheer her up while finding Izumi’s reliance and obsession with her brother (not knowing it’s Souta, of course) a little weird. I’m not sure if this is a start of some new arc where Izumi tries to run interference with Souta’s alleged relationship with Poplar the not-really-in-elementary girl or if it was a one-off episode, considering it takes her days to practically craw from one room to another. In any case, the Izumi stuff was OK. Her conversation with Mahiru was funny, but the rest was just kinda blah I thought. On the other hand, Nazuna is always entertaining and is still definitely my favorite non-regular character in the series. I would be just fine if she just showed up in every episode.